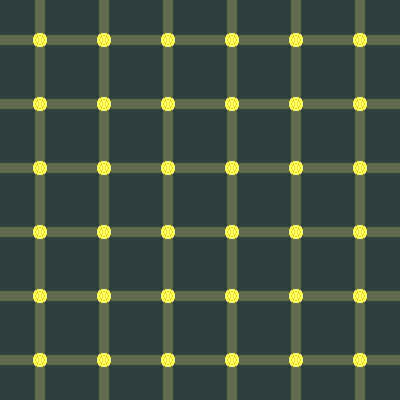 In the figure above, dark spots appear to blink at the intersections even though they are all solid yellow. M. Schrauf, B. Lingelbach, E. Lingelbach, and E. R. Wist, "The Hermann grid and the scintillation effect," in Perception, vol. 24, suppl. A, pp. 88–89, 1995. M. Schrauf, B. Lingelbach, and E. R. Wist, "The scintillating grid illusion", in Vision Research, vol. 37, pp. 1033-1038, 1997. R. VanRullen and T. Dong, "Attention and scintillation", in Vision Research, vol. 43, pp. 2191-2196, 2003.